Corporate world went into a tizzy yesterday, when news came in that Cyrus Mistry, Chairman of Tata Sons for the last 4 years, was suddenly removed by the Board. 48 year old Cyrus was only the second non-Tata to take charge of the $103 billion conglomerate in its entire history, and both entry and exit of Mistry was surprise, full of shock and sudden. As the short 4-year stint of Cyrus Mistry was cut short abruptly, Ratan Tata was reinstated as the Group’s Chairman with immediate effect. He would steer the ship for the next 4 months, as the Board sits together to find the new Chairman. Ratan Tata, in the age of 75 years in 2012 had retired from the position of Chairman after managing the company for 20 years. During the reign of Rata Tata between 1991 to 2012, Tata Sons grew from $6 billion business to $100 billion business conglomerate. Cyrus Mistry was expected to fill the void created by Ratan Tata, but he failed to impress the stakeholders and Ratan Tata himself. During his tenure, Ratan Tata bought tea maker Tetley for $450 million; Corus Group, Jaguar Land Rover for $2.3 billion, besides increasing the group’s overall income. On the other hand, with Cyrus at the help, the group’s turnover decreased to $103 billion in 2015-16, compared to $108 billion previous year. Under Cyrus, net debt of Tata Sons increased to $24.5 billion compared to $23.4 billion previous year. Hence, performance is one of the major issues in the case of Cyrus Mistry, and his sudden removal. Insiders say that when Cyrus was brought in as Chairman, his first and foremost task was to bring down debts of the company, a task he miserably failed. Friction was clearly visible when an article from The Economist questioned the ability of Tata Sons to ensure a respectable return for their shareholders, due to woeful performance in the last few years. Cyrus Mistry was not known as an ‘expansionist’ within the company, and his management style was questioned by one and all, as he preferred to write down the value of an asset, and then sell them off to bring in money to the table. An approach resented by Ratan Tata and other board members. As per another set of reports, Mistry ignored Ratan Tata’s advice and suggestions on some crucial matters, and this was not taken lightly by the Board members. His decision to sell off loss making UK Steel plants was considered a blunder, and the ongoing legal issues related with DoCOMo from Japan was something which never happened before in Tata Sons. The way non-profit businesses were being killed by Mistry irked Ratan Tata and the board members. As of now, Mistry (via family firm Shapoorji Pallonji Group) holds 18.4% equity in Tata Sons, which makes him the single largest individual shareholder of the business empire. Sir Dorabji Tata Trust and Sir Ratan Tata Trust, on the other hand, has a controlling stake of 51.6% in Tata Sons. As Ratan Tata informed PM Modi about the decision, it seems that a lengthy legal battle will start on this big corporate shake-up. 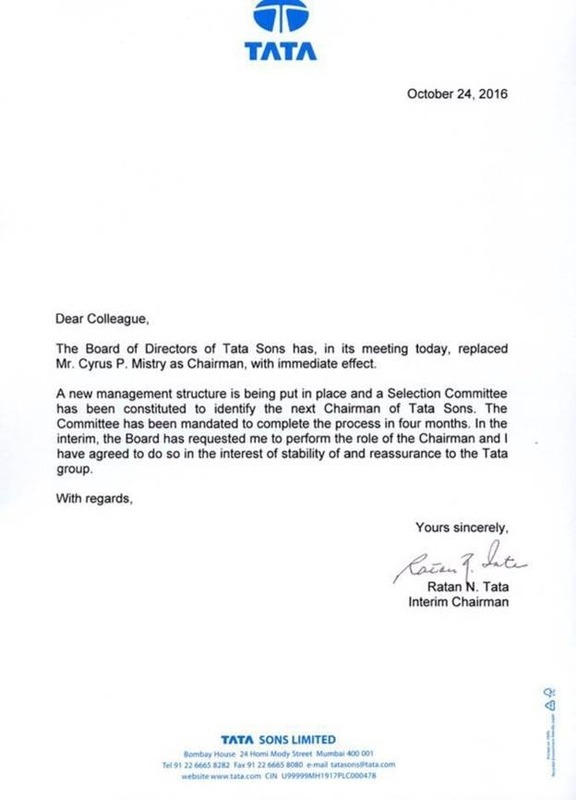 Tata Sons has already hired senior lawyers such as Tatas hiring Abhishek Manu Singhvi and Harish Salve. "4 Possible Reasons Why Cyrus Mistry Was Unceremoniously Removed As Chairman Of Tata Sons! ", 3 out of 5 based on 10 ratings. Local Trade Bodies Claim 40% Decrease in Made In China Sales This Diwali; Is #BoycottChinese Working?